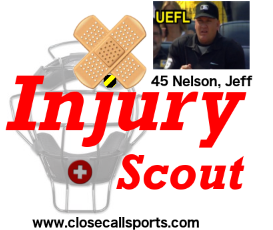 Jim Wolf collided with a player while plate umpire Jeff Nelson exited Tuesday's Spring Training action for an undisclosed reason. 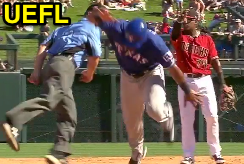 During the Rangers-Diamondbacks game at Talking Stick's Salt River Fields, base umpire Jim Wolf collided with Rangers baserunner Cesar Puello as he rounded second base, causing Puello to fall down and, ultimately, be retired. With none out and one on (R1 Puello) in the top of the 6th inning, Rangers batter Jose Trevino hit a fly ball to Diamondbacks left fielder Kristopher Negron, that Negron lost in the sun/sky. After Puello and Wolf collided past second base, the D-Backs fielders recovered to retire Puello in an ensuing rundown. As we know and Arizona broadcaster Steve Berthiaume remarked, "the umpire is in play." Rule 6.01(f) concerns umpire interference and states that such an event occurs only "(1) when a plate umpire hinders, impedes or prevents a catcher’s throw attempting to prevent a stolen base or retire a runner on a pick-off play; or (2) when a fair ball touches an umpire on fair territory before passing a fielder. Umpire interference may also occur when an umpire interferes with a catcher returning the ball to the pitcher." Accordingly, a player making incidental or inadvertent contact with an umpire (other than a catcher attempting to throw out a baserunner) does not constitute umpire interference. Alan Porter ejected Pirates Manager Clint Hurdle in 2016 during an argument concerning such an umpire-fielder entanglement. For more on umpire interference, including video examples, see the UEFL topic, "Umpire Interference." Both Wolf and Puello remained in the ballgame following their fender bender and video of this play is available at the conclusion of this post, via "Read more." Meanwhile, HP Umpire Jeff Nelson left Tuesday's White Sox-Mariners game in the middle of the 4th inning for an undisclosed reason; he officiated the entire top of the 4th before leaving the field following the frame's third out. This is Nelson's first departure from a game since leaving the May 23, 2016 Rockies-Pirates game after dirt lodged his eyes. Nelson was replaced behind home plate by 3B Umpire Mike Cascioppo, while base umpires Adrian Johnson (1B) and Stu Scheurwater (2B => 3B) took care of field duties for the rest of the contest.